Amazing reference tool and somehow I found myself using them more than my main monitors. You can work on them effortlessly because you get the clear view on what is important in the mix and what is important to human ear. And apart from the clear hearing vision I must say that the RED color presents itself beautifully. That's how you would like to start a review about Avantons, which some of the performers are probably considering. And indeed, their use - due to the unique design - predisposes them to the role of a tool in the "laboratory" of sound. Above all, it draws attention to the ultra-short pulse response (<105ms) in the whole spectrum and the specific frequency characteristics. Because of this, Avantons are most often abducted to the Yamaha NS-10. These speakers, of course, sound a bit different, but they do not differ in their application: control of the agent, control of the mix, mastering. The short pulse response is the merit of the closed housing - and this is a common feature of the Yamaha NS-10. Why only two stars behind the sound? Because these are not, of course, monitors for everyday work; their main application makes sense in A / B configuration - when we have the ability to quickly switch between our main listeners and Avants. Then they show their possibilities and ... our mistakes. Especially those with errors that appear while working on linearly playing monitors. Errors, which cause problems with the band's range and proportions, especially vocals, but also guitars or keys in the mix and between each other. At the mix stage, we control the center, while at the mastering stage we control ... measure! That's what it's about. The characteristic graph is the negative of the so-called smile of Marian. These speakers are playing the middle. Listening to music for recreational purposes does not make any sense, the sound can sometimes remind you to listen to radio on AM waves on mono radio receivers from the 80s, radio type Grundig or Kasprzak. But just ... that's it! The readability of this measure is unique and you can hear mistakes immediately. And in addition, you can easily control the bass sound to determine which band breaks in the mix above the range of standard subwoofer work. Noticing history has made a big over 40-year-old wheel and many recipients - especially young people - are playing music from ... speakers of a smartphone or laptop. And also for this are Avantons - you can boldly make corrections of the proportion / color of the mix with their help and include very positive effects during mastering. So how do you judge the sound? It should not be judged, because in the introduction the mentioned phrase (tool, not speaker) should rather treat Avanton in the category of "must have" tools, and not speakers for work. This feature is undoubtedly close to the Avantone, to the NS-10s, though .... The Avantons are playing even more paper than the white Yamaha diaphragms, mainly due to the fact that they only have one transducer. It is difficult to have any pleasure in listening to music for purposes other than work. It is poor in what is preferred in audition, i.e. rich bottom and upper bands. 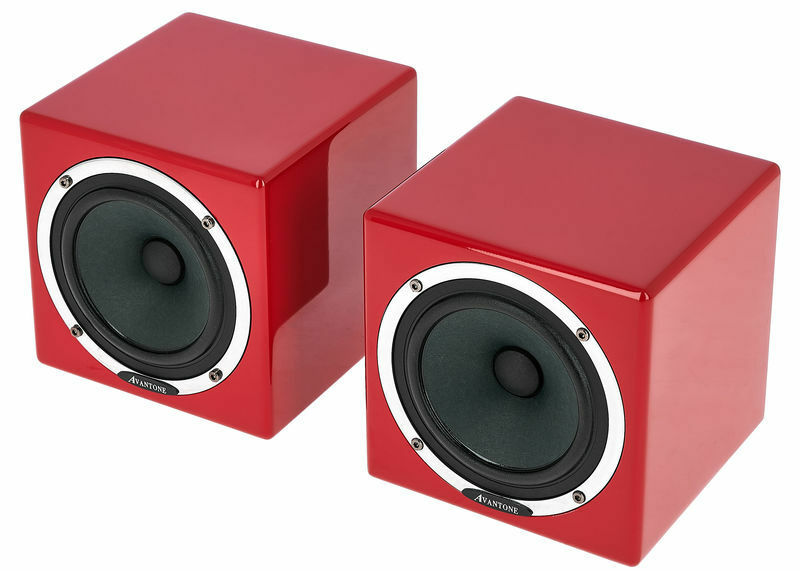 Giving 5 stars to the review reader could be appreciated that the speakers are also cool for music, and they are not. Speaker immediately after removing from the box not ready for work immediately. At first I thought they were damaged, I also checked if the cables were loose. The manufacturer in the manual expressly mentions that they are heated for 72 hours on a "pol whistle" standard music from a CD. Indeed, I have spoken to the speakers for the first time, preparation of which is necessary and not optional. If someone plans to buy them under the mastering order "for tomorrow", then he must be patient and spend a few days basking in it. Personally, I warmed about 40 hours for 3 consecutive days with a loud sweep of 20-1000 Hz in counterphase. I placed the speakers about 1 cm from each other, covered with a blanket and actually nothing could be heard (only feel the plastic from the power supplies - but more on that). Housing - in the red version - an absolute piece of art. The quality of performance is dizzying, varnish and gloss reminiscent of the completion of the world's most expensive grand pianos, only in red. The red itself is just Red, not pigmented like the so-called Reds signals. It will not do without a drop of oil in a barrel of this honey, namely ... a power supply. It can be omitted that it is an external power supply - it is clear and everyone can lift it. However, this power supply is of such a low quality plastic that on the Avantone site, I would not stamp my logo on the housing. Black plastic from the beginning simply stains, and when it warms up, it feels even more. In addition, the "interior", i.e. the transformer is not mounted, and when the housing moves, everything in the middle of "summer". The only plus which draws attention is the well-made cable from the power supply to the speaker in a special black mesh braid known from branded computer power supplies. It's all true. But be warned: it is not pleasant what comes out of them, so if you cut it, then you have the perfect mix / master. ID: 434913 © 1996–2019 Thomann GmbH Thomann loves you, because you rock!